When you see a video on the web, click on the lamp icon. And it automatic detect the video and dark the rest of the web page. You stay focus on the playing video. And you save also what energy (battery power). * The first picture left, include image from the video Milk Inc - Storm. ** The second picture right, include image from the video Regi & Kaya Jones - Take it Off. Turn Off the Lights is a free extension for your browser. It provides focus to a video you are watching and makes everything around the video go dark. It works for all video sites such as YouTube, Vimeo,... and also on the social networking sites. Focus Now. Always. Everywhere. When the installation is complete, you will see the light gray lamp listed in the toolbar (or Omnibar). And with one click of the button the page is darkened, providing better focus to the video. If no video is found, then the entire page goes dark. Today, social network is the most popular website where you can see you status of your friends, upcoming events... and more. And here you can play and share video. This extension works well on sites like FaceBook, MySpace, Netlog and many other social networking sites. The major messages are displayed on one page, click on the lamp to find a video and focus it. Perfect example on the CNN.com news site. An example where this extension also works at the company site as google.com. Here you can see all their html5 video focusing on the video. This extension works great on all the popular video sites like YouTube, Vimeo, Justin.tv, Dailymotion and so much more. Do you like not black? Then you can choose between thousands of different colors in the color picker window. What if you want you a wallpaper as background. This is now possible, you can use one of the sample wallpaper in the extension or you can paste the URL of that image in the URL inputbox. Or you can even blur the entire website and bring only focus to video element (that isn't blurred). This option is especially interesting for internet games if you want to get focus on the player only. For this great feature there are 4 custom settings. The first, is an option that automatic do the lights off when you visited a website. Second option, this will do the lights off on your chosen website in the list. If the website is not in the list, it will not dark the page. The third option, this is something what everybody what to use this feature. Here you type the time when you want the lights go automatic off. Example you set the time for 9:00pm until 6:00am. And when it's 7:00pm lights will go not off, but when it's 9:01pm then the extension will turn the lights off. Also it include the YouTube Auto HD option, so you can set self the quality of the video (default, 240p, 360p, 480p, 720p or 1080p). And you can set the large YouTube player as default video player format. The Turn Off the Lights extension detect all the embed video player on other websites. This is a feature make it possible when you current tab page is inactive (no mouse movement). It go automatic dark within the 60 seconds. Default the time is 60 seconds, but you can easy change it in my option page. To a lower or higher value of seconds. Why default black? When you watch a movie in real life the cinema it's also dark. But this dark color save you battery life on you notebook, netbook and ultrabook . Fun must be everywhere, right? Well, here in this extension there is a hidden easter eggs. When you turn the lights off (so dark), then press on your keyboard the letter T. You get the following message on screen: Do you like a real movie theater? Click OK, and you get a cinematic background behind your video. If video is finished with playing, click on the cinema background to remove it. Below few options to navigate easy on a website without losing any comfort of reading and watching video. When you enable this option and the lights is off. It show a spotlight around you mouse, so you can click on the link of the current open page. This the codename i give for this option, with this option you can click through the dark element and open that link, without the lights go back on. Select self a area to focus a item, example a text part or image you want to see only. Just click and hold the left click, drag and lost the click. This is a new feature to provide you a real time dynamic background. Then the default black color. You can choose for about five special effects with still focus the video element to the front of the web page. Dynamic background is create with the HTML5 and CSS3 code. When you enable this option, it show you few water bubbles come up on you screen. This will make a pulse of more that 50 blocks over whole you screen format. Here you see raindrops falling of you screen. This show you random cloud moving to a other position of you screen. The amazing option that you sure like it, the Space. This let you see the moving stars is coming to you, something like you are in a space ship. This is the amazing feature of the browser extension, it bring a atmosphere lighting effect around the playing video. It work for HTML5 video's and on the YouTube website. Atmosphere Lighting. This feature generates light effects around the video player that correspond to the video content. This effect will you give you immersive viewing experience. And addition, it reduces viewer eye strain and increases perceived image quality. There is three kind of option you can choose. A option to detect the color of the video and show that as atmosphere lighting effect. Or you can set self a custom color for all video's. If you enable this option, it show around the video one solid color that you have chosen from the color box. You can easy change it by clicking in the inputbox. You can change the blur & spread radius of the atmosphere lighting effect in the option page. With this you can increase/decrease the atmosphere lighting effects. This option take the color from the playing video content and show it around the video. It show the color shadow on the top, right, bottom and left side. This new feature make it possible to remove the white CSS background to black with one click on the Night Mode button. This is especially made for the night people that play YouTube video or search on Google websites. If you find a type error or got a new language that is not in the above list. Submit the translation online in this form Edit Translation Text. You always get the latest version of my extension. If a newer version is available, the "Turn Off the Lights" extension automatically get update to the latest version, so you always get the latest great features. The update packages are small and is completely free. This extension work for all browser 3 version of Google Chrome, Safari, Firefox and Internet Explorer users. Many bloggers and journalists found this great browser extension, to help them focus the show on the video they want to watch. With support for all popular video sites. With 'eye protection' to protect their eyes from that white light sheet of web pages. View the full review of our Chrome extension by pressing the star icon next to this button. Below are the quotes from the world press about our browser extension. 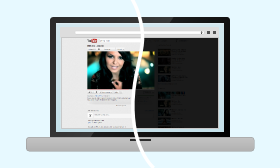 If you’re watching a video online, but can’t increase it to full-screen size, then this handy extension will dim the background of the screen, so you can focus solely on the video. Enjoy your media with less bright distractions like animated ads and banners. Fazit: Eine wirklich gelungene Erweiterung für Firefox. Sie ist Pflicht für jeden, der gerne Filme und Videos im Internet ansieht. Thank God for this 'Turn off the lights' extension on chrome. It makes everything less bright. Love it!!! Makes the videos more pleasurable to watch on Youtube. Also, helps with the blinding white view of youtube. Very fun, amazing and useful to have. 1. Is only for the Google Chrome, Safari, Opera and Firefox extension. 2. Windows Internet Explorer doesn't got all the features yet. 3. In the latest version of Google Chrome 18, Safari 5.0.1, Opera 12, Firefox 16 and Internet Explorer 9 or higher.